WILMINGTON, Mass.--(BUSINESS WIRE)--Analog Devices, Inc. (Nasdaq: ADI), announced it has officially broken ground on its new global headquarters in Wilmington, Mass. The expanded facility will feature state of the art laboratories, design and manufacturing and cross-functional group collaboration space. In addition to 147,000 additional square-feet for research and development, the global headquarters will include a 50,000 square-foot Hub comprising a café, fitness facility and auditorium designed to enable and encourage employees from all departments and functions to gather, connect and engage. At a ground-breaking ceremony on July 11th, the Company hosted Jay Ash, Secretary of Housing and Economic Development for the Commonwealth of Massachusetts, Senator Bruce Tarr, Jeff Hull, Manager of the Town of Wilmington and other dignitaries from the Commonwealth, Associated Industries of Massachusetts, the Town of Wilmington Board of Selectmen and Finance Committee. 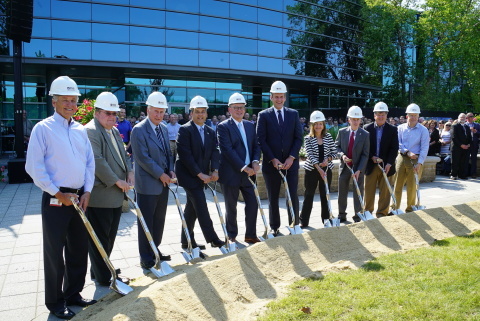 Following brief remarks from guests including Analog Devices’ Co-Founder and Chairman Ray Stata, executives and speakers participated in a celebratory ground-breaking. A pictorial history of the Wilmington facility was on display alongside renderings of the new facilities and renovations to existing structures that showcased light-filled spaces and greenery in and outside the buildings. With a presence in Wilmington dating back to 1981, Analog Devices is the longest-standing and largest manufacturer in the town. From underwriting local STEM scholarships to sponsoring athletics and contributing to environmental causes, Analog Devices has been a reliable partner and supporter to the local community. Analog Devices partnered with architect Steven Baker on design, and Lee Kennedy for construction. The Company anticipates moving into the new buildings by 2020.